Description: The battle between vicious spirits and strong-willed queens that started in the award-winning The Queen of Blood and continued in the powerful The Reluctant Queen comes to a stunning conclusion in The Queen of Sorrow, the final volume of Sarah Beth Durst’s Queens of Renthia trilogy. 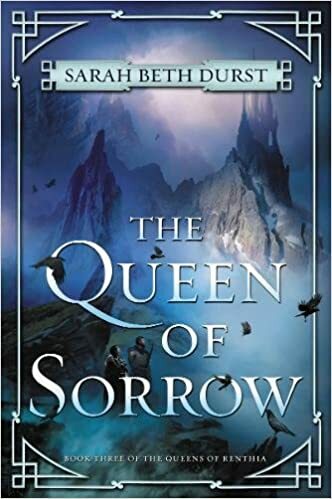 My Thoughts: THE QUEEN OF SORROW was a wonderful conclusion to an epic fantasy series. It begins with Aratay in disarray after Queen Merecot of Semo's failed attempt at invading it. Queens Daleina and Naelin are trying to use their spirits to repair the damage that the invasion did before winter arrives. But Queen Merecot is not finished. Her next attempt at conquest begins with her kidnapping Naelin's two young children. Naelin, who loves her children more than anything, makes an attempt at rescuing them by invading Semo which causes even more problems for Aratay when her spirits cause more destruction. Merecot has a master plan that will either solve the spirit problem or throw the world into chaos. She is convinced that her plan will work but it requires that the Queens in Aratay both abdicate in her favor. Queen Naelin, along with Ven, goes to Semo to try to rescue her children and solve the problems in Semo caused by extra spirits who aren't tied to land. Naelin does release her Aratay spirits, which are reclaimed by Daleina, and takes on the extra Semo spirits but former Queen Jastra has her own plot going. She kidnaps Naelin's children again and takes them to the untamed lands. People have believed that no one can survive in the untamed lands, but Naelin is determined to go there are rescue her children. There she learns about the beginnings of Renthia and learns more about the spirits and what they want. This fantasy series is filled with fascinating characters from the selfless Daleina to the amoral Merecot and Garnah to the faithful Champion Ven and Healer Hamon. I think Naelin is the one who grows the most through this series as she learns more about the spirits she was raised to hate and makes life-changing decisions. I recommend this series to all fantasy fans. Even when we feel the most alone, we are not. Even when things are the most bleak, they will get better. There is always hope. A lovely, if simplistic, sentiment. Listening to the glorious vocals, Hanna almost believed it. I received this one in exchange for an honest review from Edelweiss. You can buy your copy here. Don't you love it when the conclusion is everything you hoped it would be even though its sad to reach the end.